Yet more thoughts from our (apparently quite long) lunchtime conversation about community-building. We talked extensively about how, but where would these strategies have the greatest impact? It’s important to jump off the price escalator — to opt out of the gentrification process — early on, before outside capital floods into the neighborhood. The “tipping point” in neighborhoods is always tied to outside money. First, an urban neighborhood is “discovered” by suburbanites looking to spend their extra $20s in cute restaurants, then by institutional investors looking for $2 million investments, and pretty soon the whole place jumps the shark. But if the small dollars are ever going to have a chance to win the game, they’re going to have to start early on — or else console themselves to small, subsidized slices of the neighborhood, post shark-jump. “Favored quarter” locations in gateway cities are probably too far gone (more on this in a future post). Even the immediately adjacent areas have probably been bid up too far to be affordable without turning to outside capital. A Place Corp takes a substantial investment of time, rather than money, so the key is not to overpay. In Houston, the Midtown TIRZ spent $15 million to purchase 34 acres of the adjacent Third Ward, including hundreds of vacant lots, which was then handed to nonprofits and thus taken off the market. By the time the usual affordable-housing resources, like TIF funds and inclusionary units start to flow, it’s already too late — prices will already be on an upswing. For maximum effect, resources need to start flowing before new construction and new investment create new amenities, which raise property values. Of course, this requires neighborhood organization (and probably capacity-building) beforehand, to identify areas about to undergo change, and to plan for the process. Think of it as an approach comparable to Transferable Development Rights, which have preserved many rural communities, just applied to urban communities instead. 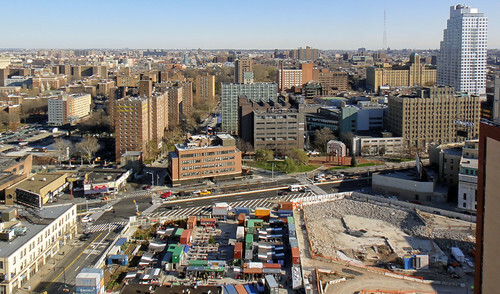 To use the photo as an example, imagine if some of the value created by the Downtown Brooklyn rezoning (affecting the sites in front of Flatbush) could also have steered capital funds towards rehabilitating and expanding NYCHA’s Ingersoll Houses (at back right).